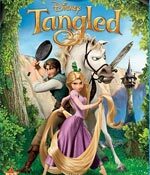 One of 2010's biggest hits, Tangled, which has grossed about $560 million worldwide is now turning out to be a huge hit on DVD and Blu-ray. It has sold over $80 million worth DVDs and Blu-ray editions in its opening week this month in America and Canada, more than what the film grossed in its first week in theatres. It is the highest grossing DVD of the year so far. There is a good chance that Disney's 50th animated film Tangled could be on the top 5 DVD/Blu-ray sale lists across the globe for many weeks and for excellent reasons. Disney's retelling of the Rapunzel story is not only a handsome production but also a funny and entertaining cautionary story of the perils of over protection, a celebration of rebellion, and finally, affirmation of one's self. The graphics are certainly done in an old-fashioned style but it is also a quick-paced film and though the songs are not as alluring like the ones in several other Disney classics, the animation, especially of the horse with its own mind, are eye-popping. The voices are simply marvelous. Despite the movie having a lot of repeat value, it has grossed about $200 million in North America, making it a solid hit. But it is likely to have a bigger impact with the DVD and Blu-ray combo that offers lasting entertainment in an intimate milieu. Its exhilarating spirit, wonderful visuals and a couple of melodic songs will keep beckoning young and older viewers for many years. Mother Gothel (Donna Murphy) hoards a magical flower with healing powers that keep her young. When the pregnant queen becomes gravely ill, the blossom is taken away to save the queen and her baby, Rapunzel, transferring its magic to the infant's golden locks. Mother Gothel kidnaps the princess in no time and hides her in a tall tower, posing as the child's overprotective mother who tells all the time that the outside world is too dangerous. Rapunzel (Mandy Moore) grows up lonely and wanting to get out of the tower. She is intrigued by the mysterious lights that illuminate the sky each year, not knowing it is connected to her birthday. life faces a big challenge. She feels that Rider has a good heart and she strikes a bargain with him, leading to unexpected adventures and a glorious climax. Between the DVD and Blu-ray, we recommend the latter version as it has many more extras, amounting to about 50 minutes. Best is to go for the Blu-ray/.DVD combo pack. The Extras include two versions of the original opening, a quick look at all 50 of the Disney animated films and a few deleted scenes. .The Blu-ray also has three deleted scenes and two extended songs, with introductions by Nathan Greno and Byron Howard, the directors. There is also a 12-minute making of featurette hosted by Moore and Levi. 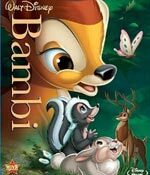 Disney is having a wonderful month, with the Blu-ray edition of its timeless Bambi dominating the charts. Released in 1942, Bambi has remained one of the most popular Disney films, shown often on TV. The Blu-ray edition offers crisp rendition of this wonderful coming of age story. You may even consider buying the Blu-ray/DVD Combo Pack which is filled with some of the best extras seen in a very long time. Filled with memorable characters, the combo pack offers not only great nostalgic experience to older viewers but also beckons a new generation into a different kind of movie magic. Apart from Bambi, the young deer whose birth leads to a number of unexpected story developments, there are such intriguing characters as Thumper, a young rabbit whose one of the first at the birth of Bambi, and Flower, an adorable skunk. The interactive games are a great add-on for the young viewers who are watching the film for the first time. Extras include Bambi: Inside Walt's Story Meetings, a Picture-in-Picture track featuring clips from the story meetings during the production. You also get an opportunity to jump to an in-depth featurette.